The room is set up in an orderly, simple, beautiful manner, based on the two basic needs of the infant: bonding with their natural caregivers and support of their basic needs. The materials provided within the environment, with the early assistance of their teacher, helps the child’s sense of self and independence to develop as the child naturally grows. The main goal is for the toddlers to begin to gain a true sense of independence and order while continuing to build strong interpersonal relationships. Initially, practical life and sensorial skills are primarily found in this classroom, as the children are still learning the basic skills necessary for higher academics. The other academic areas are introduced as their skills increase. 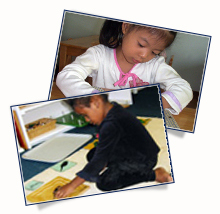 Here the variety of Montessori materials increases exponentially. A child’s skills for learning are practiced by using the wide range of Montessori materials available, as the academic elements of the classroom become more challenging. Introduction of math and literature journals begin. When children are able to work in this way, they more than prepare themselves for future learning situations. The main goal in the preschool program is for the children to learn to be responsible for their own learning, which is a key element to one’s success later in life and in school. 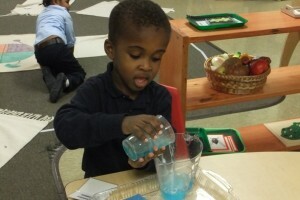 We begin a more in-depth academic course and begin a more extensive use of the advanced Montessori materials. We introduce more project based activities, while also building on additional group activities and field trips, while enhancing individual skills and knowledge base. We begin a more extensive use of individual journals for language, math, and the sciences. The main goal in this program is to allow the child to continue to build their skills and improve comprehension and understanding through knowledge gained, while truly preparing him or her for the first grade and all of their future educational experiences.